Chez Bobin is on farmland 15 minutes from the medieval town of Montmorillon. It’s a five minute drive (or a short cycle ride) from the busy village of Lathus St Remy, which has a couple of bakers, a bank, a supermarket and a bar. There’s lots more about Lathus here. There is a great restaurant – Le Voulzie – a few minutes away from the house right on the river, which is open all year round. There are some great places to eat in Montmorillon and our favourite La Marmite is about 20 minutes away in a small town called Le Dorat. 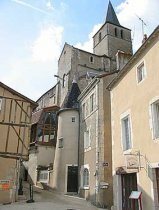 Montmorillon is a lovely old town, known as the Cité de l’Ecrit, and therefore full of second-hand book shops. It has a beautiful stone bridge over the Gartempe river and some very old churches and other buildings. Take a look at the video opposite. It also has a big E.Leclerc supermarket on the outskirts, a typical town square with a variety of shops, and some good restaurants, as well as a Creperie overlooking the river. 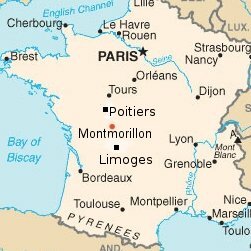 Find out more about Montmorillon. The surrounding countryside has some great walks and is ideal for cycling with many trails. There are three adult and one kids bike in the garage. There is river a short walk away, with swimming in the summer. 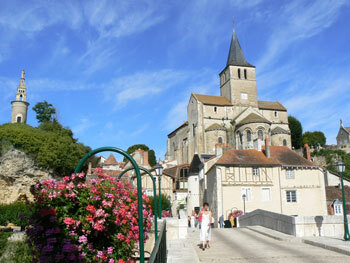 Lathus has it’s own beauty spot – Le Roc Enfer, on the river a short walk away. Montmorillon has an outdoor (and indoor) swimming pool. The nearby towns of Le Blanc, Chauvigny, Le Dorat and Bellac have lots to discover and some great restaurants. There’s some good fishing in nearby lakes and rivers (bream, carp, trout). Fishing permits are very cheap in France, and can be bought for short periods. 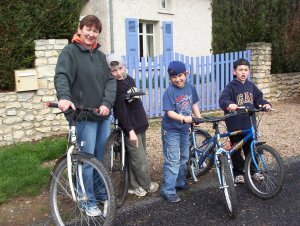 We had great fun on the velo-rail at Chauvigny, where you ‘cycle’ along an old railway line into the countryside. There is a riding stables 5 minutes away, and the kids have had lots of lessons with the English speaking instructors there. If you are an experienced rider you can just hire horses for a few hours. There is an activity centre down the road that offers all sorts of outdoor pursuits for kids from 4 – 17 from fishing and rock climbing to wind-surfing and sailing – they even have a circus school! Take a look at what they offer here. All surrounding towns have markets: Montmorillon’s is on Wednesdays. There is the largest market-fair in the region at a small place about half an hour away called Les Hérolles on the 29th of each month. It’s amazing and well worth a trip.In July and August there are loads of local village fairs, fetes and music festivals. Son et lumiers shows at Le Dorat – 20 minutes away – are organised throughout the summer. 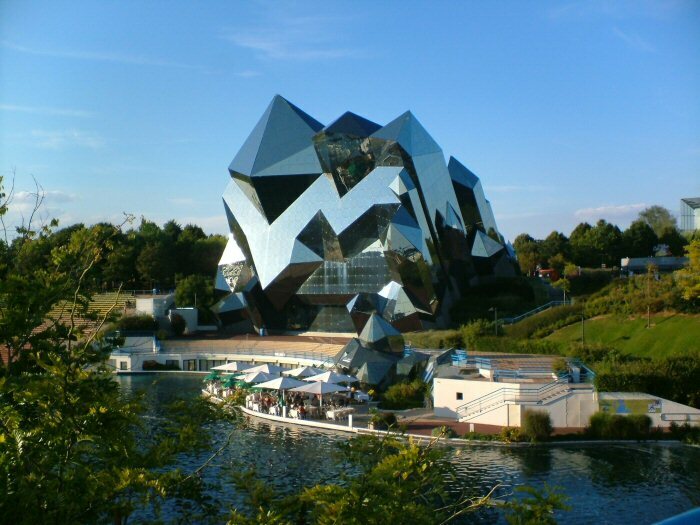 Futuroscope, a 21st century theme park, is under an hour away and well worth a day out. They even have kennels if you take your dog. There’s the Vallee des Singes Monkey Sanctuary where the monkey roam free, about an hour away. And also a Crocodile Centre and Bird of Prey centre less than an hour from the house. Both Poitiers and Limoges are lovely old cities with much history and culture to explore (and some great shops and restaurants).